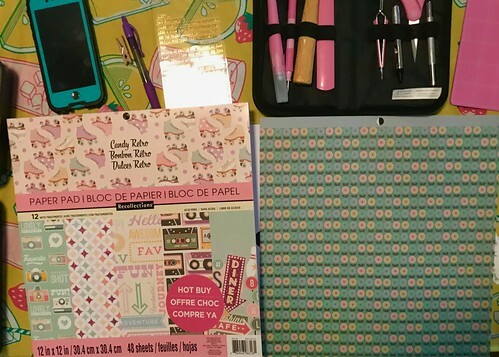 Last December, I bought my MAMBI planner at 50% off at Michaels. 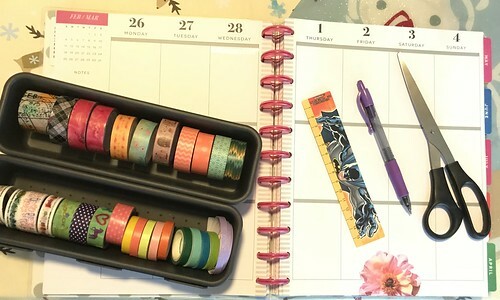 My daughter helped me pick it out and I had no idea how useful this planner would actually be! The reason it was so cheap is that it actually is an 18-month calendar and six of those months were almost finished. 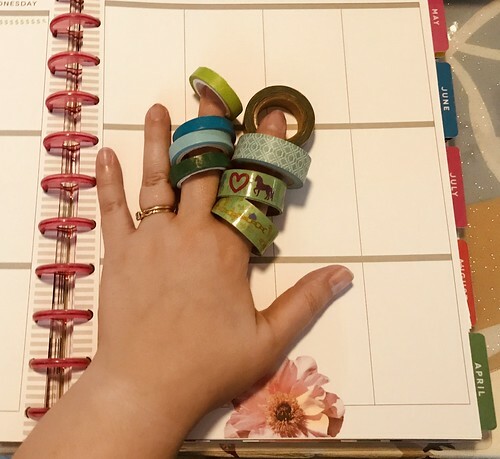 So, when I first set up my planner, I just moved the past months to the back, thinking that I would use stickers to repurpose those pages and dividers for the first five months of 2019. Since then, I’ve read about how other people in the planning community use these spare pages. I thought it might be better to just use these pages as memory/sticker pages. 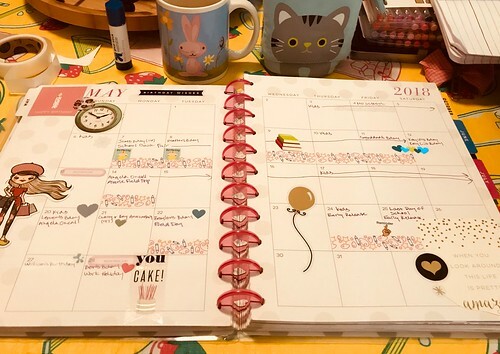 This way, I can devote a whole page to various events and projects this year as well as keeping stickers handy so that I don’t have to pull out all of my stickers just to mark a last minute event on my calendar. If that doesn’t work, I can always change it up again. That’s the beauty of the MAMBI planners! 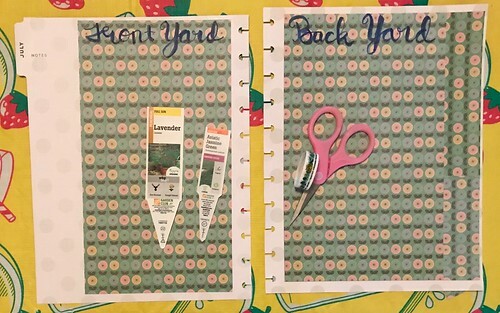 The first project page I want is for gardening and my other outdoor projects. 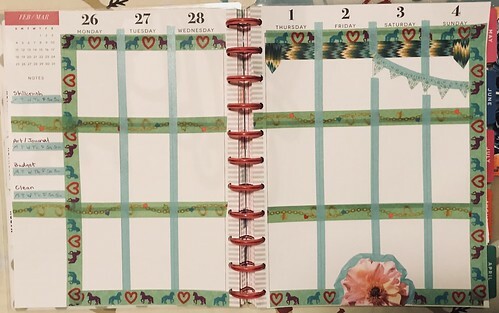 July is the only month I had tried to convert for 2019, so it already has some date stickers on the page. I’m going to cover this up with scrapbooking paper. 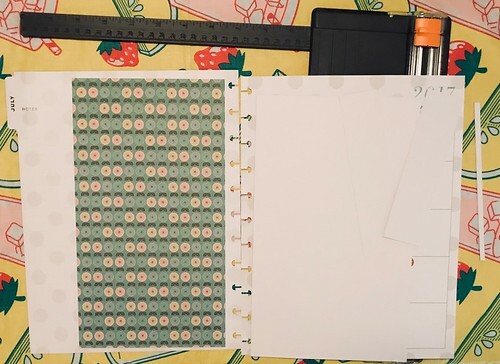 I found this great flower pattern in my Candy Retro paper pad that I got on clearance at Michaels. 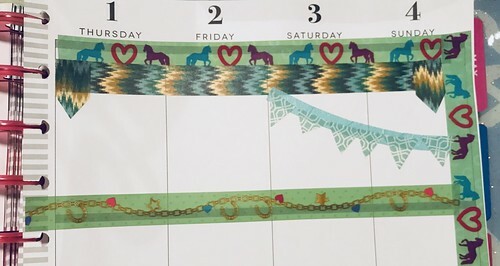 I’ll use my Fiskarspaper cutter to trim it and then will glue it down with stick glue over the calendar pages. I’m not quite the professional or experienced craftsperson that I would like to be, so I don’t know the best way to measure and cut these papers. 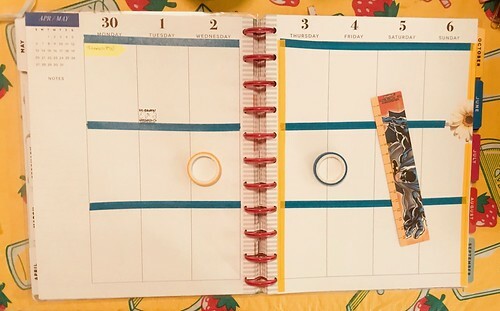 I placed the paper wrong-side up on each planner page and marked where I need to cut in pencil. Then I used the paper cutter to do that. It’s not super fancy, but it works. Now, I just glue everything to the calendar pages. 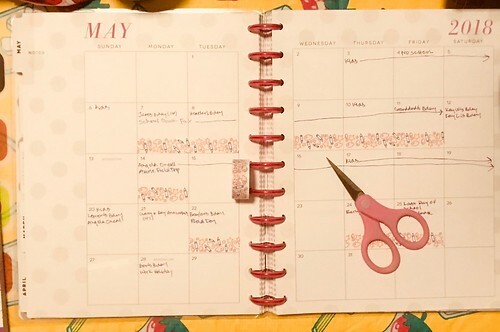 I just use a glue stick on the paper and the calendar pages, lay down the flower paper, press down with my hands, and then use a bone folder to flatten it out a bit more. Easy peasy! I’m going to use one side to document things I do in the front yard, and the other side to document what I do in the backyard. I took the opportunity to practice my lettering 🙂 Eventually, I’ll make another tab so that I’ll know that this is not my July area of the planner, but I just wanted to get the pages started for now. I’m adding two planter thingies from the plants I bought for the front yard and hope to add pics later. I also like the sidebar for notes so I can record dates and other info if I want. 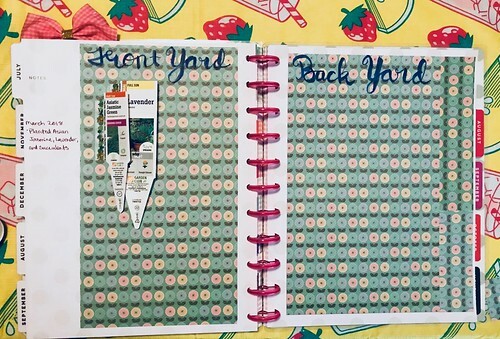 Overall, I think these pages look pretty good and will be great memory pages for my outdoor projects this year. Thanks for reading this post! 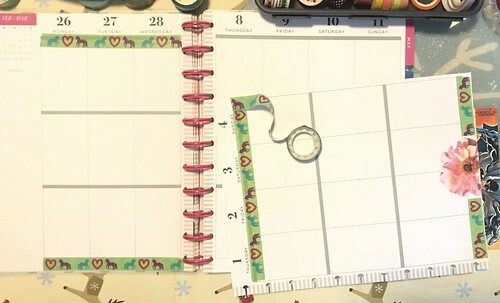 Let me know what you think about Dr. Frankensteining extra planner pages. 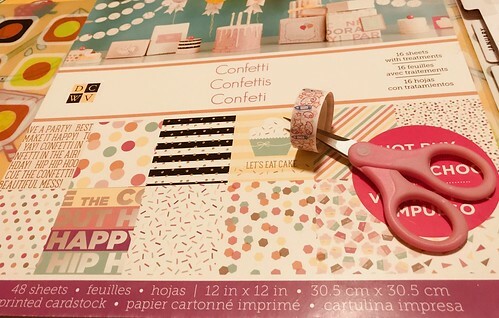 Have you ever done planner scrapbooking before?